Pests can pose a serious hazard to your health. Find out more about the common household pests and the average pest control cost in this guide. Pests can invade your premises at any moment, causing damage and a lot of stress. If you are looking for professional pest control services the following guide will help you find out more about the pest control prices offers by various pest removal companies. Rodents : Rats and mice need to always gnaw to keep their teeth filed down and could cause damage to furniture, fittings and electric cables; they can even cause a fire by ruining cables and wires. The are also many health risks carried by rodents. For instance brown rats carry 13 different kinds of parasites and illnesses including salmonella. Bedbugs : Because bedbugs are small and as flat as a piece of paper, they can fit inside any crack or crevice, which makes them extremely hard to eliminate. Bed bus feed mostly on blood. Bees, wasps and hornets : These insects may be difficult to identify, so you ought to hire a pest control specialist, as there are specific guidelines you have to follow when dealing with bees, which are important for pollination. Hornets and wasps, however, are more aggressive and you may need to have a professional pest controller to remove it. Cockroaches : These bugs are quite common, especially in crowded housing environments. They are able to carry diseases and like to hide in wall and ceiling voids, rubbish or furniture. It’s essential to maintain a tidy home and garden to prevent any cockroach infestation. Ants : Ants are a common garden pest which may also invade your house. However, ants are comparatively easy to get rid of with using an excellent powder. Moles : This pest can severely damage your garden as they tend to create their own enormous network of tunnels and prefer to eat mostly insects instead of garden plants. A pest control professional will probably use traps to get moles, as many poisons are now prohibited. Squirrels – Squirrels can cause a great deal of damage, chewing through insulation, woodwork, wiring and pipes. They may be aggressive when challenged and carry diseases – you’ll need to rent a professional to cope with squirrels. The potent treatments and powerful chemicals, available to the professional pest controllers, constitute another great benefit. Such products and services will offer better results compared to the chemicals and treatments that you can purchase from a DYI store. People who want a permanent protection for their home can also consider the fact that such services deliver preventative treatments over the period of time proposed by the homeowner. What are the main problems that you need to consider during the winter season? Considering the fact that various types of bugs and insects can enter your home during the summertime, it is quite possible that you will host some of them during the winter season as well. Even though many homeowners believe that insects will normally go dormant during the cold season, this is not necessarily true. Some of them find the necessary resources to survive and thrive during the winter season by hiding in various places of our homes. Regardless of the climate conditions, you should know that your home is not totally safe from creepy critters. Some of the most common places where various insects may hide in your house are the wall voids, the places where you store old items, in your basement and in the places where there is moisture. The bedbug is practically the most common nuisance in the last couple of years, since it is a real danger for homes, hotels, and offices everywhere. This insect is not as vulnerable to cold temperatures as we thought it was, according to some recent studies. Every homeowner should practice preventive maintenance to avoid pest infestation in their houses and yards. Here are a couple of practices that you can implement to protect your house against pests. Sealing your property during the winter months will not only help you save money on energy bills, but it will also help you keep unwanted pests away from your house. Some of the best methods that you can use to reduce the entries through which bugs can enter your home are caulk, stripping and spackle. Bugs can also access your home through a draft, so make sure you solve this problem as well. Replacing broken window screens and installing screens over the vents and chimneys of your home are also great practices that you can use to keep the pests population under control. Pests may be attracted to various things from our yard, so make sure you maintain it properly. Woodpiles should be stored at approximately 25 feet away from the house to prevent termite infestation. Rodents love the leftover produce of a garden, so make sure you eliminate it as soon as you can before the winter sets in. Make sure you wash all the plates after eating and keep your kitchen clean all the times. To get rid of the insects that might be hiding in your carpets or furniture, you need to vacuum at least one time per day. Use plastic containers to store various items, such as clothes or dry goods. Studies have shown that these insects do not hibernate during the cold months. To remove the bed bugs from your home efficiently, the best idea would be to request the assistance of a professional exterminator. 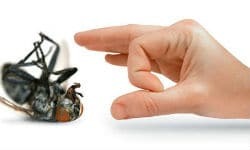 It is practically impossible to get rid of these insects by yourself, and it is why it is important to call a trained professional as soon as you recognize such a problem in your house. There are a number of ways to remove pests, such as fumigation, using traps and poisons or relying on more natural methods. The idea of using traps and poisons to get rid of pests may not sit comfortably with everyone – after all, they are not the most humane method available if you don’t know what you’re doing. However, if it is done in a professional way, it is an effective pest control method that shouldn’t be overlooked. Some devices such as the traditional mouse trap can seem brutal, though some pest control specialists use traps that capture the animal and then they release it safely elsewhere. Many bugs can be killed off through the use of chemical sprays but for the quickest method of pest control you should consider investing in an electric zapper trap, which will do the work for you. However, these are not effective at killing off serious infestations and pesticides are still often the best method to use in these cases. 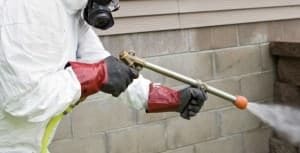 When hiring a professional exterminator who uses pesticides, ask them if the chemicals they are using comply with the Control of Pesticides Act 1986 and the Control of Substance Hazardous to Health Regulation 1994. This will ensure the chemicals comply with the relevant government legislation and are safe to use. Fumigation is only used for the most extreme infestations. In these cases the property is sealed off and a gas is pumped in, designed to kill all the pests. This really is for the most serious infestations and is fairly expensive, yet thoroughly effective – you will probably need to leave the property for a few days in this case. The cost to fumigate a house increases depending on the location as prices tend to be higher in bigger cities and in particular in London. This is a way of reducing the number of pests on your property without the guilt associated with laying poison traps or the use of chemicals. Biological elimination works by introducing predators into the natural environment to hunt the pests in a natural manner, providing ecological balance and harmony to your property. This is best suited to large areas of lands and although somewhat effective, it won’t entirely remove a pest problem. This is an easy and obvious way of removing pests – taking away their habitats or whatever it is that attracts them to the area. For instance, a pile of rubbish may seem to be a bountiful feast to a pack of rats – removing it will mean they won’t have food and will have to re-home themselves elsewhere. Rubbish should be kept in sealed or inaccessible containers to prevent rodents picking through them, as well as stopping flies or other insects from gathering. It’s difficult to establish an average pest control cost as private company rates vary. Wasp control From £55 Price of one nest only. £210 for a three-bed house. Ant control From £100 One spray treatment with a six or eight week guarantee. Cockroach treatment From £120 This is the cost of a single treatment for a one- bed house. For each extra room add another £20 – £30. Rodent Control From £120 Cost for four treatments. Mole treatment From £90 Cost of two treatments, depending on how many mole hills you can find in your garden. Bird Control From £60 This the cost for inspection and quotation. It is a good idea to try and get cheaper pest control services through your local council. Underneath preventing Damage by Pests Act 1949, each council is obliged to control the rodent population in their own region. Mouse traps can be purchased at relatively cheap prices from a range of hardware shops; raw bacon and peanut butter make particularly good bait compared to the traditional option of cheese. An ant infestation can be destroyed by applying a mixture of sugar-and-borax around the perimeter of the home; the sugar attracts the ants, and then the borax chemical acts as a poison. Some homeowners, however, find hot water straight from the kettle can be just as effective. If you run out of insect spray to get rid of any flies or wasps that can’t find their own way out of a room, fear not – hairspray also works just as well. Garden pests such as slugs – which often attack your more delicate and beautiful plants – can also be killed by covering them in a small amount of salt. If you’re looking for a more humane, preventative method, then you might want to regularly lay down grapefruit halves around your most precious flowers. If you’re worried about flies or mosquitoes in the hot summer months, you can always stick up protective nets around the porch, veranda or even conservatory – as long as there are no holes in the material it should keep them from being a nuisance for a pretty long time! Maintaining a clean and tidy home indoors is very important as insects and smaller creatures such as mice frequently use clutter and mess as shields to hide behind. If you’re still having trouble, you should check for any small holes or cracks in the walls where pests might quietly gain access to the property. Large cities like London can become more prone to pest issues and unfortunately, like most things in London, pest control costs will also be greater than it really is inside the remainder of the nation. London pest control services will even charge differently depending on the: i) the level of infestation ii) the size of the infested property iii) the type of treatment and iv) which are you live in. To help you understand the cost of pest control in London, we have created a table that indicates the prices for on residential treatment. It may be tempting (and cheaper) to address pest control yourself, but it’s safer and much more humane to hire a specialist. Qualified pest control specialists will be able to spot pests correctly and know which treatment approaches to use. Get at the least three quotes before you hire; all pest control companies should perform a free review and provide guidance – be constantly aware that you could need greater than one treatment to remove pests completely. Check that the pest control professional covered, is qualified and has good references. You may want to consider someone registered having a trade association including the National Pest Technicians Association (NPTA) or even the British Pest Get a handle on Association (BPCA). You should get a couple of quotes from a professional and be aware that pest control prices will vary depending on the type and size of the infestation. A professional should be able to give you a ballpark figure about the pest control cost for the work beforehand. Asbestos Survey Cost – How much does a survey cost?